Final preparations for Bubble: The Kids Trade Show this Weekend! The countdown to Bubble begins, and Green Nippers are excitedly counting down the hours until we can show our collections of organic baby clothes and organic childrens clothes to lots of potential stockists. We exhibited back in January (which seems like only last month! ), and there was an increase in international buyers. It would be fantastic if we could gain additonal international stockists. Here you can view our current list of Green Nippers stockists. We will update you after the show about how we get on! The Natural & Organic Show was a great success! We have just returned from a busy weekend at London Olympia, at the Natural & Organic Show. Our products were very well recieved, and we have now gained several more stockists. It is great that we will now be selling our products in organic food and health shops, oure new stockists from the show include: Bundle of Joy, Bow Baskets and Organically Speaking. We are still in the process of confirming additional stockists from the show, including shops in Hong Kong, Malaysia and Denmark. Final preparations for the Natural & Organic Show this Weekend! We are almost ready for the organic event of the year. We will be showacasing our beautiful organic baby clothes, accessories and gift sets on stand 6002x (within the Soil Association stand). We hope to see you at the show this Sunday 3rd April or Monday 4th April. Hello to all of you Yummy Mummy's out there! A whole week has been dedicated to all of you fantastic Mum's, and then to finish off a great end to a great week it's time for you to sit back and relax on Mother's day. Yummy Mummy Week is a week packed full of fundraising events held by mums, for mums. Friends and families are encouraged to get together and have fun, and raise money for a great cause to help children with cancer. Green Nippers are supporting Yummy Mummy Week 2011 (28th March - 3rd April 2011). We will be donating 10% of our sales this week to the CLIC Sargent's charity. Every day 10 families are told their child has cancer. CLIC Sargent are the UK's leading children's cancer charity, and are the only organisation to offer families all round care and support. Following our success at the Living North Christmas Fair in November we decided to return back to Newcastle Racecourse this Spring! We had a very busy and successful few days at the show. It was just great to see returning customers who bought from us at the Christmas Fair, who now have other friends or relatives with new born babies to buy for! It was of course great to meet so many new customers too :-) We were also in talks with a new shop that will be opening in Ponteland later this year, so watch this space! Green Nippers will soon be stocking in a shop in the North East! Green Nippers are big supporters and believers of Fairtrade. We believe it is very important how and where our clothes, and other products are made. Our products are ethically manufactured in a textile factory based in Istanbul in Turkey, who ethically produces high quality organic products. We have visited the bright, clean and spacious factory where the Green Nippers products are made. It was reassuring to see that all their employees had excellent working conditions, were not over worked, were paid fairly and most importantly they was no child labour. All our products are ‘ethically’ and ‘fairly’ traded but the Fairtrade certification does not apply to the production of the Green Nippers products as Turkey is a not a developing country. Therefore the Green Nippers products, although ethically made, cannot carry the Fairtrade certification mark. The Baby Show was a great success! But it was lovely to hear great reviews from them about how well they washed and were easy to care for – and they even recommended them to their friends that were having/ just had babies. They don’t need to be too upset that their babies do not fit in our clothes any more as our new collection up to 5 years will be launched in August 2011. We thoroughly enjoyed ourselves at The Baby Show and have already booked to do the show again next year! Shortly after the show we booked to do The Baby Show in Birmingham in May 2011 and The Baby Show in Earls Court in October 2011. We are already excited to be exhibiting at the 2 other shows, especially the Earls Court show as we will be launching our new collection up to 5 years! Ready for Day One at The Baby Show and Some Good News!! We are now in London at The Baby Show, our stand looks lovely We set it up this afternoon and have taken some pictures to show you all! We also forgot to mention that we our mannequin is making it’s first appearance at a show! We thought it would be beneficial to our customers that they got to see how our gorgeous organic baby grows looked on a model. Our mannequin (yet to be named – please email us with any suggestions!!) will be wearing the Green Nippers Apple Blossom organic girls baby grow and matching hat in the lovely girly rose colour. We are getting very excited about exhibiting at The Baby Show, London Excel from the 18th to the 20th February 2011 … only a couple of days to go now. We have been very busy getting all of our stock together and will be loading up the van with our gorgeous organic baby clothes tomorrow! We managed to source some pure organic cotton buds from a recent trip to Spain so it will be great to take them to the show to educate our customers about how our garments start! Our products start their life from an organic cotton plant which is grown in a field in Turkey without the use of harmful chemicals and pesticides, and finally blossoms into a gorgeous and colourful organic baby product! There are many stages along the way, which are closely monitored by the Control Union, but we think it is fascinating how our organic baby products start their life!! Also we are currently waiting to find out if our organic baby outfits have been chosen for fashion show, fingers crossed our gorgeous baby clothes will have been selected for the catwalk! Green Nippers have just returned from a very successful show at Bubble: 30th & 31st January 2011! Bubble is a kids trade show, based at the Business Design Centre in Islington. We launched Green Nippers first children’s wear range: The Junior Collection at Bubble in January 2011, which proved to be very popular. 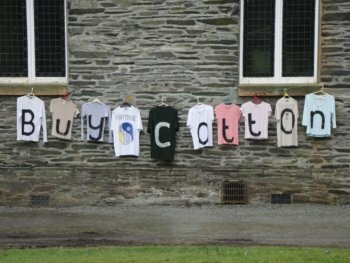 New and existing stockists have already secured stock from our Autumn/Winter 2011-2012 range, which will be available from August 2011. At Bubble, we also showcased our trade mark baby grows that are designed as ‘little outfits’, which are practical, comfortable and suitable for all year round. Our baby grows are perfect for special occasions, day wear or just lounging about in. We carry our organic baby grows in stock all year round, which are available to purchase through our website: www.greennippers.co.uk and a range of stockists throughout the UK and worldwide! Green Nippers have just signed up to exhibit at the Living North Live Show at Newcastle Racecourse from the 25th-27th March 2011. We exhibited at a couple of shows at this lovely venue in 2010. We enjoyed ourselves so much and met some very nice people, that we will be returning back up north again in 2011! The 2011 Living North Live event is set to be the biggest event this spring! Green Nippers will be exhibiting our gorgeous and eczema friendly organic baby clothes on the first floor in the Gosforth Park Suite, accompanied by a wide selection of gifts, fashion, lifestyle, health and beauty products. Green Nippers exhibit at a range of shows throughout the UK. Barnsley Central Library Goes Green for the Day! Green Nippers visited the ‘Go Green‘ day at Barnsley Central library this morning, it was great to see and hear people providing advice about how to lead a greener life style. Green Nippers were busy networking at the event and educated many people about organic baby clothes. We also managed to fit in an interview with Penistone FM. A broadcasting of the interview was played on Penistone FM throughout today, it will also be available on our website shortly under the ‘Press‘ section. We’re heading back up to Newcastle again! We are busy making preparations for the Living North Christmas Fair next week at Newcastle Racecourse from Thursday 4th – Sunday 7th November 2011. We would love to see you there, please visit Green Nippers at Stand A10 in the Gosforth Park Suite to view our colourful and unique organic baby clothes and accessories. At the show there will be special offers and free Christmas gift packaging on all orders, making Green Nippers organic baby clothes the ideal Christmas gift. We have a limited number of complimentary tickets to give to our customers, please email customercare@greennippers.co.uk if you would like to go.